If you find yourself in a situation where you need a hot tub removed because of a move or remodel, Hot Tubs Denver is here to help. We have a great deal of experience removing hot tubs in Denver, and we know that safety is one of the most important factors. Removing a spa in Denver can be quite the ordeal, and you need a company that will keep you and your property safe. The highly skilled team at Hot Tubs Denver will make sure that you and your property are safe and that everything is left in great condition. The key to a successful removal of a spa in Denver is the planning and preparation. Our team will assess all of the factors around your hot tub and make sure that their plan for removal will work without causing any incidental damage. There is no one better than Hot Tubs Denver to help you with a safe removal of your hot tub! 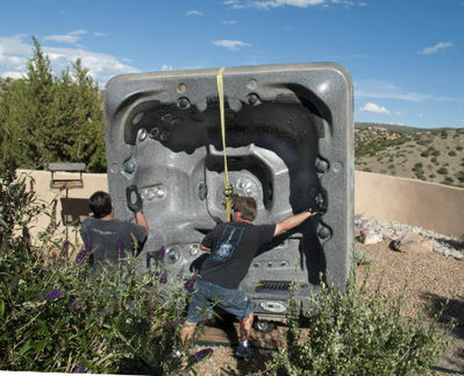 If you think that your six person hot tub is too big to be removed by the team at Hot Tubs Denver, then prepare to be amazed! O ye of little faith, we are equipped to handle and hot tubs in Denver and have already successfully removed almost every kind of spa! There is no situation or hot tub that catches us off guard. While other companies may try to make you work around their convenience for removing a spa in Denver, we work hard to make the removal process more convenient for you. We will do our best to make your removal happen without having to change any other pieces of your property. If you think that your two person hot tub is in an awkward location and that removing it will just be too difficult, call us for a consultation. We feel confident that no matter what you need for removing a Denver hot tub it will be well within our capabilities. For any property situation, size or style of hot tub, or any other factors, the best team to remove hot tubs in Denver is definitely Hot Tubs Denver! While every removal is different and requires a custom quote to determine the exact cost, Hot Tubs Denver will work hard to keep you within your budget. With our expert advice and help planning for the removal of your Denver hot tub, there will be less overall cost for you. The reason that we can keep costs low for removing a spa in Denver is that we are all about working smarter instead of working harder. That is not to say that we do not work hard, but we are not going to make you pay for extra work that could be avoided by excellent planning. So call Hot Tubs Denver to get a low price and efficient removal of a Denver hot tub right away!